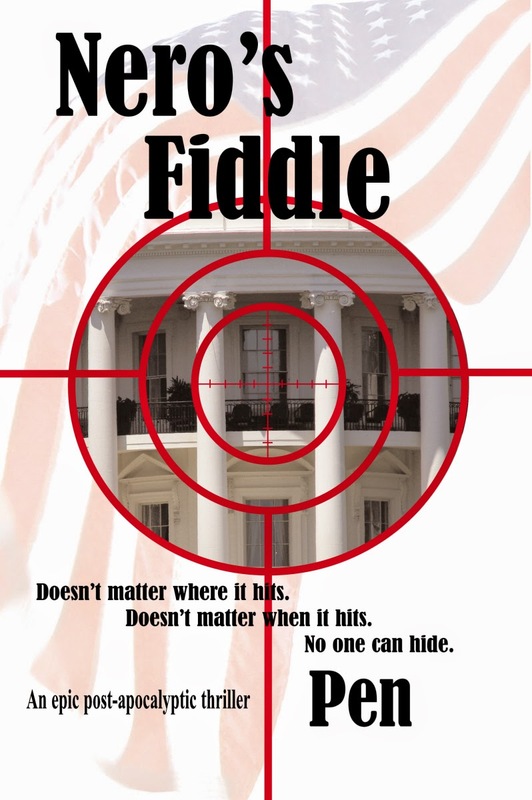 Today we are interviewing Pen, author of the thriller/action/sci-fi novel Nero's Fiddle. I have been writing since the age of ten and have self-published 20 titles. I am a native Georgian, currently working a full time job to support my writing habit. I am also staff to one feline named Clairee (although she does answer to “Queen Clairee” as well). I enjoy writing, reading, watching movies and I’m a big fan of Once Upon A Time. I also make crafts and quilts. On a hot June day in 2017, the United States is hit with an Electromangetic Pulse (EMP) attack. This wipes out everything electronic. Captain Beverly Mossberg is tasked with the assignment of making her way to Washingon, DC to assassinate the terrorist before he attacks any other countries. She finds herself responsible not only for her own survival but also for the survival of her two children and a stranger who throws her lot in with Captain Mossberg. Once she finally arrives in DC she finds she has been misled – again. But this time, she has the weight of saving the world on her shoulders. People who enjoy action, family drama, apocalyptic scenarios and survival of the human race stories. Women in the military, anyone who enjoys female protagonists, conspiracy theorists, fans of James Rollins’s Sigma Force novels, and those who like to be left with a little hope at the end of it all. What inspired you to write a novel set in the United States after a disabling attack by an Electromagnetic Pulse? I listened to the audiobook One Second After by William Forschten. I was fascinated by the electromagnetic pulse technology and did some research. I was surprised, and a little scared, to learn this technology is real and available. The more I listened to the book, the more I began to visualize my own concept of an EMP attack. My version has women heroes. Captain Beverly Mossberg is tasked with getting to D.C. despite the chaos. Tell us a bit about this character. Captain Beverly Mossberg, aka Cap’n Mossy, is a former Marine sniper. There has never been a woman sniper in the history of the military until I created one. She suffers from PTSD after a life-altering incident during Desert Storm. She’s very stoic, especially when it comes to her two children, Michael and Jaz. I have never had writer’s block. That’s because there is an endless supply of material about which to write. I actually have 21 novels in my queue waiting to be written. My biggest problem is there is never enough time to write. My next project is the survival of the human race on another planet. The female protagonist, Niva, must stop the destruction of the planet while battling the indigenous species. At the moment, it will be a five part series. I am a huge James Rollins fan and can’t get enough of his Sigma Force series. I especially like the way he time stamps the action. His writing influenced me to do a “daily count” in Nero’s Fiddle because Captain Mossberg has 30 days before the next EMP is launched to complete her assignment. As Bev walked to the edge of the rooftop and gazed down at the bear, Sedona slowly, carefully, pulled herself to an upright sitting position. She intentionally put her back to the dead body. Michael and Jaz walked around to her line of vision. “You okay, Arizona?” Michael asked. The poor kid’s face was grimaced with worry. “You look a little, um,” Jaz searched for the right word, “gray. I would say you look a little green around the gills, but it’s hard to tell.” She took off her backpack and unzipped it. “You’re welcome.” She looked as though she wanted to say more but she didn’t. And Sedona didn’t press. She knew there would come a time when the girl might want to continue their discussion in more detail but certainly not within earshot of her mother. She opened the bottle and took a tentative sip of water. She waited to make sure it stayed down before taking another. “Good point,” she agreed morosely and took another sip of water. “What?” Michael asked following her.